The Council elections are coming up on 4th May (remember to register to vote). These local elections will elect people who will represent all of us in our communities going forward. Whilst national politics dominate the headlines, these are not the issues that will be affected by this election. Instead, it will affect our schools, roads, parks, environment, transport. And one of the major things that Edinburgh Council has responsibility for: planning. The Friends of Craighouse and the people all across Edinburgh who supported the site were hugely disappointed when the planning committee voted in contravention of the numerous planning policies and protections on the site to push through inappropriate and excessive development on Craighouse. Whilst our local Councillors of all stripes spoke up for us – a block vote of all the Conservatives on the planning committee and many of the Labour Councillors did the most damage. We are not a party political campaign and there are very involved members who support every different party at a national level. However, it’s important for people to know how Councillors voted on this issue as it set precedent for the whole city. With many Morningside and Craiglockhart Councillors who supported the community (including Paul Godzik, Mark McInnes and Andrew Burns) all standing down at this election, it’s important for Craighouse and if people want to protect other important green spaces such as the Hermitage and Midmar Paddock, to elect Councillors who have a good track record on these issues. It’s disappointing to see that the Conservatives have chosen as a candidate the ex editor of the Scotsman and Evening News, John McLellan, who used his journalistic platform to support the money-losing developments at Quartermile, Caltongate, along with running article after article pushing over-development at Craighouse. Shying away from his local area, he is running instead in Duddingston, ominously declaring his interest in getting involved in planning matters on the Council in this article in the Evening News. We are not a party-political campaign with very involved members who actively support each of the above parties and the Liberal Democrats. However, it’s important people know how Council members vote on issues that affect their areas. You may also remember that some local councillors supported the community at the hearing, but their party colleagues voted the other way. Planning committee hearings are not supposed to divide along party lines. They are also applying for building warrants, but we see no sign of applications for New Craig, the large listed building that all this was supposed to save. Based on their applications for building warrants, it looks like they will be doing some of the newbuild first plus some small listed buildings – the ones that are the most profitable and therefore not really part of the “Enabling Development”. There is no sign of applications for the biggest building on the site that this “Enabling Development” was supposed to be about – listed building New Craig. We are very sad to let you know that Friends of Craighouse member, supporter and friend, Douglas Hamilton, has died. A tireless champion of the site and a great supporter of the Friends of Craighouse, Dougie – as he was known to all – did so much. Working hard flyering and writing letters, we particularly remember and have him to thank for the tireless work he did – out in all weathers – collecting signatures for our petition. Online petitions were just becoming fashionable at the time, but we deliberately decided to keep things local and go for a hard-copy paper petition – the old-fashioned kind – to demonstrate the amount of support in the local community for the site. Of course hand-signed petitions take a lot of physical legwork and Dougie was a huge part of this endeavour – out each evening, rain or shine to let people know about it. We were thrilled when we collected nearly 6,000 signatures from the local community. So much so, that we were questioned for not looking cross enough in the resultant photo in the Evening News. As you can see we all look quite pleased with our enormous petition! Dougie was a central figure in our campaign and continued to defend the site up to the present time. Aside from the great affection we all held him in, he was a well-known person in our local community and will be hugely missed – a great character and a lovely man. We are so sorry he is no longer with us and we want to send all our good thoughts and sympathy to his family, including his wife, Gill, also a great friend of the site and who has been so supportive over the years. Companies recently registered at Companies House have the Craighouse name in them. Could it be that Craighouse is being bought by the owner of Quartermile, property investor, Moorfield? The company names imply that it is the “MREF III” Fund by Moorfield that is buying Craighouse, which is the same fund that owns Quartermile. We have talked about Quartermile (the development of the old Royal Edinburgh Hospital) several times before as the A-Listed Surgical Block at Quartermile has been left undeveloped for 15 years since it was sold in 2001. At the end of last year, the Surgical Block was sold to Edinburgh University. It is Edinburgh University that will do the conversion work of the surgical hospital. The clear question coming from this story is: if converting to housing didn’t save the main A listed buildings at Quartermile, why try to do that at Craighouse? The Quartermile development had gone through a series of owners, bailouts and sales. £500m of debt was written off when the publicly bailed-out bank Lloyds took over Quartermile’s owner, Gladedale, in 2009. We will give you more information when we have it. The Craighouse planning consent was supposed to save the listed buildings, but instead all that is being proposed right now is yet more demolitions. 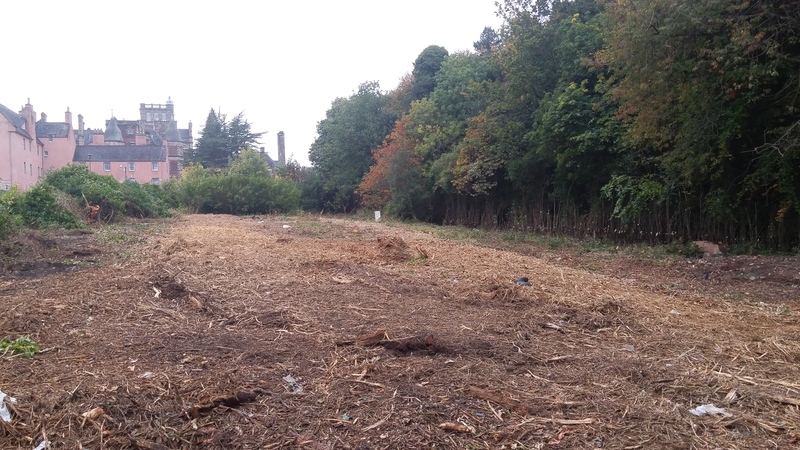 Yet again, we are being asked to object to the planning department to stop further destruction of the site. See at the bottom of this post for instructions on how to object. William Gray Muir, the developer pushing for the planning consent to “save” Craighouse has now moved onto other projects and refuses to talk about Craighouse anymore. While new investor, Clearbell, markets the site as “Residential development land” and is seeking “delivery partners“. A series of building warrant applications on the Edinburgh planning portal for Craighouse are only for demolitions: no sign of building warrant applications for renovations or construction. In less than two years, the enabling development has failed. The application asks to demolish the chimney shown on the right as it is leaning and has become unsafe. But the proposals are not to repair this chimney. The tall chimneys are a key defining feature of the architecture of these A listed buildings. The chimney should be repaired, not demolished. What is the point of the enabling development if parts of the site are gradually demolished as they deteriorate? The current planning applications ask to remove the current gates from the pedestrian entrance to the site, including one of the stone pillars. The application states that the materials will be stored for restoration at some unspecified point in the future. But when? The gates are being removed for “site traffic egress”. But, this route is highly unsuitable for construction traffic. There are no plans presented for the route construction traffic will take. In the meantime, what is to stop the owners putting up another “temporary” wooden barrier, blocking access to the site? No planning application was made for that temporary structure and once the current gates are gone, something needs to be put in place to block unauthorized vehicle access. No plans are supplied that prevent unauthorized vehicle access, but allow pedestrian access. The “enabling development” was supposed to preserve public access and save the buildings. The risk is that this is a precursor to blocking public access to the site until such time as a buyer is found who is willing and able to fund the restoration of the listed buildings. The enabling development was supposed to save the buildings, not lead to further demolitions. The chimneys are critical to the design of the A-Listed buildings and should be repaired, not demolished. The entrance gates being removed are not a suitable exit or entrance for construction traffic and there is already a construction traffic route. No plans are shown for how to stop unauthorized vehicles going into the site via the entrance once the gates are removed. 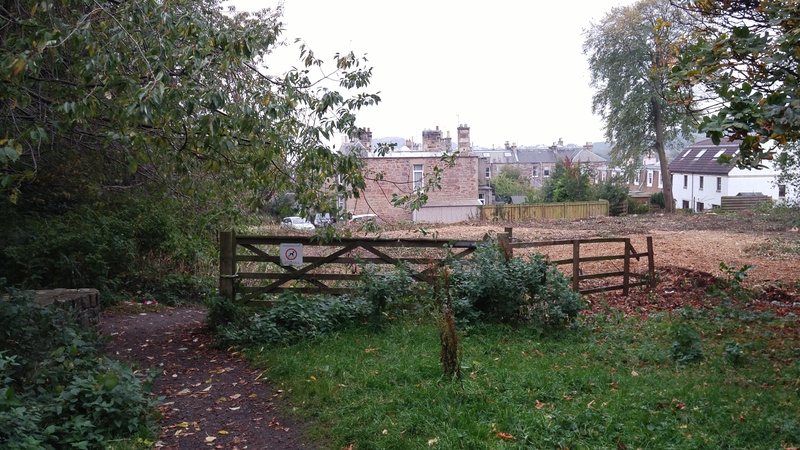 If the gates were replaced with a “temporary” structure like the other entrance, access to the site would be blocked, which would break a key commitment made by the applicant for the current consent. The map in the application is out of date and does not show the current main entrance, which is critical to understanding the application. The Scottish Government are claiming that Scotland doesn’t need regulation of the lobbying industry because it already releases all meetings that Scottish Ministers have, including with lobbyists. Except that in the Craighouse case, they haven’t. You may remember that after a tip-off, we knew that Mountgrange (the owner of the Craighouse site) and their lobbyists had got a private meeting with John Swinney in 2013, but wanted to know more, so we submitted a Freedom of Information Request. It took a huge amount of campaigning and appeals over several months to get the Scottish Government to honour that FOI request and release some information about that one meeting. So, hardly the transparency that the Scottish Government claim there. But what about the public register of Ministerial Engagements? Well, for May 2013 (the month of the Craighouse meeting) John Swinney’s appointments are nowhere to be found. Instead, the meetings for June 2013 appear twice. OK, so you might think it was an honest mistake. So, we asked them. They ignored the request to correct the information, instead claiming “the Scottish Government is committed to increasing transparency”. Here are the engagements, but I wonder if you can see any commercial lobbyists in this list. It looks to us like they list the clients of the lobbyists, but not the lobbyists themselves. The campaign to release this information continues, as does the campaign to get the Scottish Government to commit to a *real* lobbying transparency bill, such as those in other countries, like the USA. 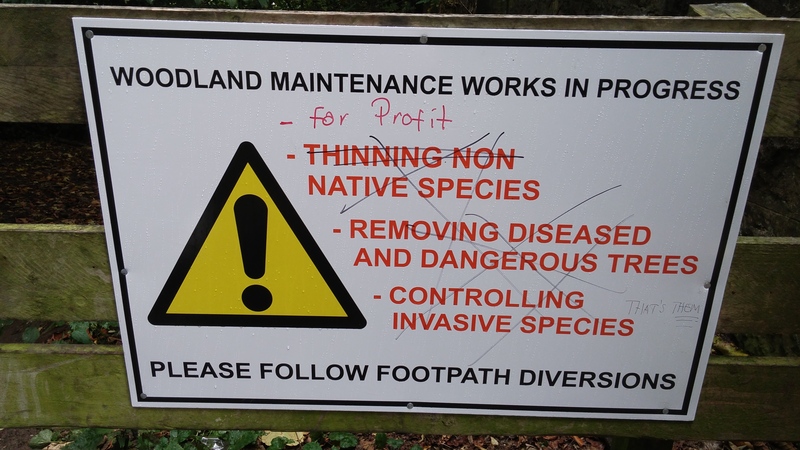 Woodland clearance work at Craighouse has started and it isn’t pretty. We had expected that before such works had started the council would ensure that proper protections for drainage, flooding and wildlife would be in place. All we hear is of delays to drainage plans and silence on tree protection and wildlife protection. We have asked several times, but received no replies at all. We will let you know if we hear anything, but in the meantime we encourage you to contact your local councillors. Mountgrange’s previous developments, such as Caltongate, were left in a state like this for years. The site is now managed under Mountgrange’s new name, “Clearbell”, where it is described as “Residential Development Land”. We assume the new name, Clearbell, is to disassociate themselves with the past financial failures of Mountgrange, but the same staff are involved just transferred to the new company. Are Sundial still involved in the project? We asked William Gray Muir, but he refused to answer. Susan Davison, who worked for Sundial during the Craighouse project is now back working for Clearbell, having previously worked for Mountgrange during the Caltongate years. It’s very sad to see such beautiful places wrecked like this. The community is very upset. There are signs saying this is just for invasive species, but the pictures show the work is woodland clearance.